Mom, the Intern: A story about tables. When Dill and I got married, his siblings went in on a wonderful folding table and set of chairs as one of our gifts. It worked great in all of our apartment situations and we really loved it. 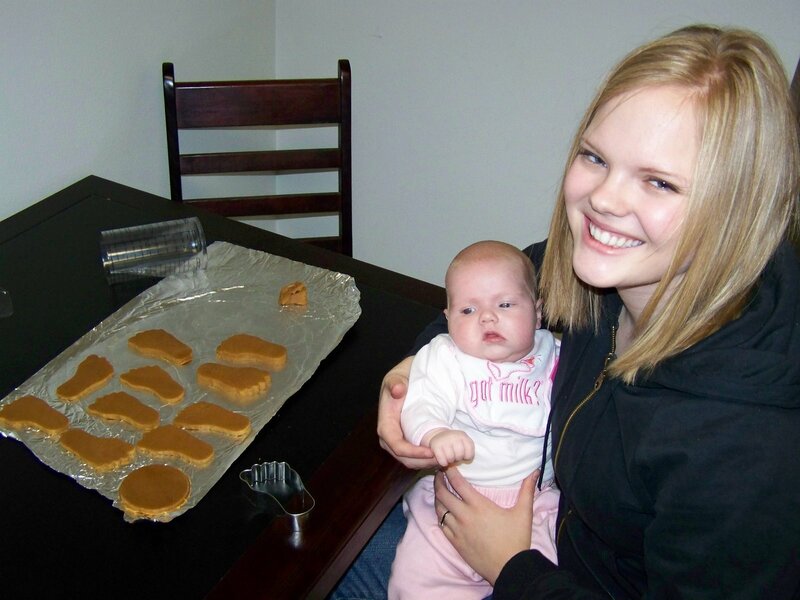 There's baby Bubby and me making gingerbread cookies on it. You can see how snazzy it is for a folding table. When we moved back from Utah, my parents kindly gave us their old dining table-- a real dining table with cushioned chairs and all that jazz. But it was about 10 years old at the time and it sagged in the middle, so we had to prop that part up with a 2x4. Aside from that inconvenience, we liked our table and got a lot of good use out of it. This was in our Mesa apartment, just after we moved in. Take note of the money on the table. What was it doing there and not in my wallet? And can you spot the 2x4? The hand-me-down table came with us to our first home, which we purchased almost exactly two years ago. It was fine enough for me, but my mom hated it. It seemed like every time she came over, she'd chide me about how I needed to get a new dining table already because this one had already been through at least three owners (besides us) and the 2x4 was "just plain white trash." But there were a few problems with that idea: 1) we had just bought and fixed up a home so we had a small budget to work with and 2) I couldn't find anything I liked at a price I could afford. I wanted something unique but not over-the-top; something homey but not too rustic; something timeless but also current. Dill and I searched endlessly for a non-hillbilly dining set. We went to all your traditional furniture showrooms but we never found one we really loved. Plus, I couldn't stand being followed around by sales associates every time I'd walk into a store. They'd always pressure us and breathe down our necks while we tried to look. So then we tried IKEA, but there just wasn't anything there I loved. Also, I'm not sure IKEA is the ideal place to find sturdy furniture, and I was hoping our new table could hold up for a good decade at least. I had heard about this local furniture dealer called Cortate. They were located in a strip mall and the store had no real showroom -- just a bunch of catalogs to look through. But their prices were notoriously low, so I thought I'd give it a shot. The thing I love most about Cortate is the employees are there to facilitate your browsing and purchasing and nothing more. No pressure to buy. No following you around with a clipboard. Just helpful people who help you order furniture. My kind of shopping experience. Anyway, we had zeroed in on the table we wanted, but life happened and other things had to come first. So the table would just have to wait. I KNOW, RIGHT?!?! So perfect. And here's the best part: This same dining set, at its very cheapest, retails at $875 online. So, if you're looking for a good deal on furniture and you live in the greater Phoenix area, try Cortate Furniture! I love almost everything about it. The one downside is you can't usually see their merchandise before buying it (they do have fabric swatches if you're ordering custom upholstery). For some people, this is a must. For me, it isn't. Cortate definitely offered the best prices of any vendor we visited which was probably the biggest draw. As for me, I'm adoring my new table. How could I not? And when my mom comes over, she won't have to censor her thoughts about my ugly table anymore! I have some friends up here who love that place and go down just to shop there. The owners used to live up here by us, I think. Or maybe he just works there. Who knows! But I have heard great things about it. We were in your neck of the woods for soccer on Saturday. Quail something park. Off 202 and greenfield. hooray for new (grown-up) furniture. it looks great in your house. That is a beautiful table! And a great deal to boot! I'll have to check it out when we get back to AZ. I love your new table! I don't see a 2x4 on the old one though - am I blind? What a darling table! I LOVE it!